Welcome to a Valentine's Day edition of You've Been Spotted! Creative Team Member Donna Mikasa spotted Anuyami's adorable card in the MFT Flickr Group. Donna says, "Anuyami added so many details on her card, and the texture on her sheep is a fun touch." 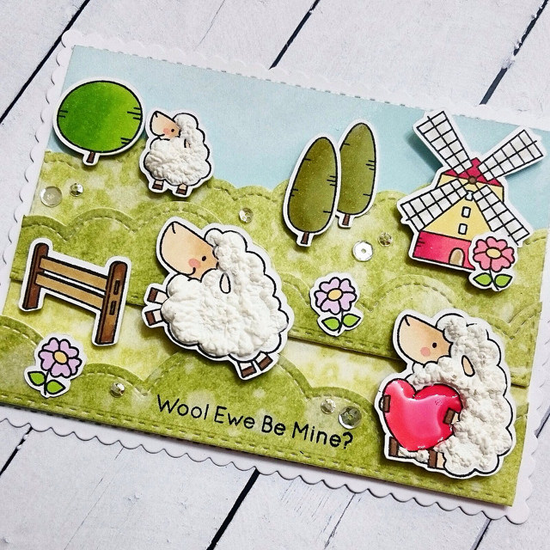 Yes, the Ewe Are the Best stamp set and Die-namics are certainly a fun way to express your love! I spotted Jan's artsy card in the MFT Challenge & Inspiration Facebook Group. Jan submitted this card as an entry for Sketch 263. Her unique use of All Heart, Distressed Patterns, and Love You More stamp sets make for a really fun design. Kudos, Jan! I spotted Jill's pink and gray concoction as an entry for Sketch 263 as well. I super love the soft color combination, but the sparkly liquid in the flask and the red heart stir stick just make make this design so super delightful. 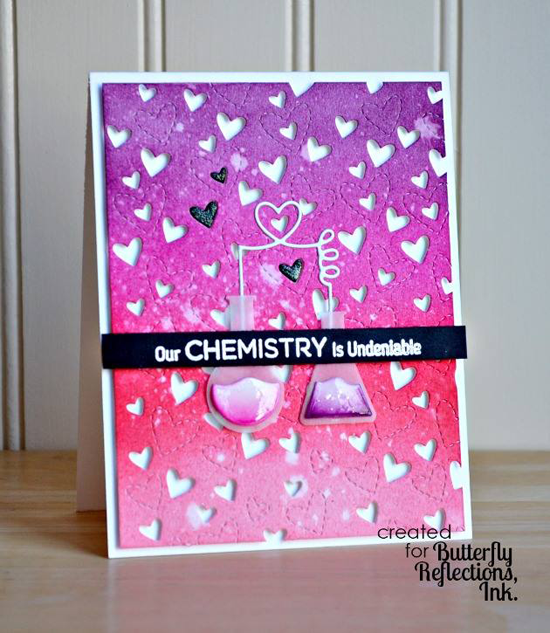 I love Jill's card about as much as she loved the Undeniable Chemistry stamp set and Chemistry Set Die-namics! I spotted Lindsay's card on the Butterfly Reflections, Ink blog. Her riot of color is a stunner, of course, but her glossy accents in the flasks and the crisp white on black heat embossed sentiment is totally TDF. Who knew chemistry could be so stinking pretty? I spotted Olga's so so CUTE Valentine's Day tags on Instagram following #mftstamps. I love this trio of tags she created with the Ewe Are the Best stamp set and Die-namics and the Tag Builder Blueprints 5 Die-namics. There are so many elements in both of these products that you can mix and match to your hearts content! Thanks for using MFT, ladies! You've left us inspired, and that's what it's all about! See you tomorrow for another great Sketch Challenge, and look for the next MFT Color Challenge this Thursday, February 11th! These are darling!! Congrats, everyone, on being spotted!! These are so fun--great job! All jobs are so beautiful! Oooh!Thanks for spotting my card! It's truly an honor! <3 thanks a lot for spotting my card!! Thank you so much for the love, Susan! Great cards, everyone! So fabulous!